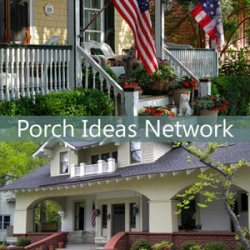 Screen panels for porches, decks, or patios are so versatile you can easily use them to transform your area into a screened porch or even three season room. 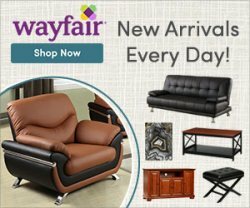 We will show you 8 different ways! Think of the fun you and your family will have by extending your outdoor time in comfort. Play games, have parties, or perhaps just relax in a bug-free environment. 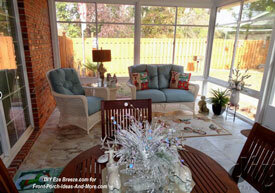 Obviously, screen panels or screen porch windows are the most important part of a screened porch. Let us help you choose the best porch screening option for you. Let's step through the options you have when it comes to screen panels for porches, decks, and patios. Which one is best for you, your skill level, and your budget? Use 1x3s or 1x4s to make the frame. Miter cut ends of each piece, then join together with waterproof glue, end nails, and corrugated fasteners and/or splines. Stretch screen material over the wooden frame. Fasten with staples on the screens making sure they are tight. NOTE: Make sure to keep the screen mesh at right angles to the frame. First, staple across the top, then the bottom, followed by the sides. Stretch the screen as taut as possible and secure staples every 2 inches as you work your way from the center outward. Cover the stapled edges with 4-inch batten and secure with 3d galvanized nails. Nail 1x4 or a piece of lattice (small thin strip of wood) over the stapled screen edge. 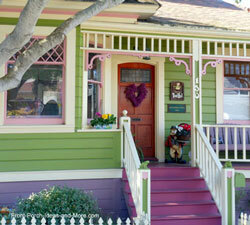 Add moldings to the porch frame. Tip: Stretch the screen tight enough but not so tight as to cause a distortion. Advantages: Relatively low cost and easy to install. You can choose to add decorative trims. Disadvantages: Screening larger openings without visible screen distortion may be difficult. If you need to repair the screen, you'll probably have to replace the whole thing as it's hard to take it apart and put it back together. It's also difficult to paint or stain the railings around the screen. These are custom-made screen panels for porches that are easily installed and maintained. You can use various options - like wood, acrylic knee walls or acrylic storm panels. Building screen inserts (also called removable screens), is a bit more involved because it calls for careful measuring, then having framed screens made or making them yourself. But, in the long run, removable screens are far more convenient because they can be taken off for repair or when they're not needed or wanted. It's also much easier to stretch screening tight across removable frames. Although you can make screen inserts yourself, having them made by a professional screen shop is usually a very affordable, reliable option. The better quality the screening material, the longer it will last. Select your screening material based not only on your requirements but also costs as well. If you have small children or pets, you might want to consider selecting pet screening material - a very strong screen that can take some punishment and still look great. See where we compare the various types of screening material for you. Of all the DIY options, sliding panel screen windows are our favorite. Not only do they give you the instant benefit of a screen porch, but also turn your new screened porch into a three season room. They can be made to fit almost any size opening using the existing framing in most cases. No more storing windows in summer or screens in winter. 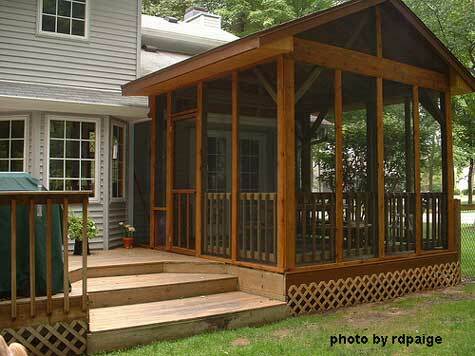 Advantages: easy to maintain, can use screen porch as 3-season porch, no storage required, aesthetically pleasing. 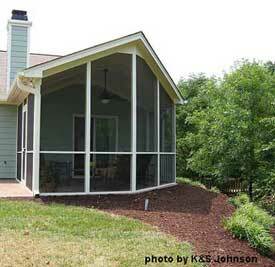 Learn more about these neat screen porch windows. You will build separate frames from either wood or aluminum. Stretch the screen over them and hold in place with a spline system (i.e. a groove and rubber spline). You push the rubber spline into the groove to hold the screening material in place. Note: Aluminum framing is usually available in 12' lengths. It can be cut with either a hack saw or chop say with a fine tooth blade. The frame is held together with corner inserts and screws. If building wooden frames, I recommend using 2x2s or 1x2s for the wood frame but other sizes can work as well. Cut the spline using a router with groove bit or you can cut them on a table saw. Don't make the groove/spline too wide or it won't hold the rubber spline and screen securely. Purchase your materials and make test your cuts / assemblies prior to cutting everything - please! Square your framing and secure your joints before installing the screening material. Advantages: Very convenient and functional. Screen frames allow you to easily remove the entire screen for maintenance, replacement, or to temporarily replace it with glass or acrylic panels. Disadvantages: Screen frames cost more than stapling screen to your porch framing. You can find frameless screening systems as screen panels for porches that use strips of Velcro to hold the screens in place. Some are available with clear plastic - so you could change out the screen for the plastic when the weather gets cooler. Screen Tight is designed to eliminate the old method of staples, nails, wooden lattice and paint. 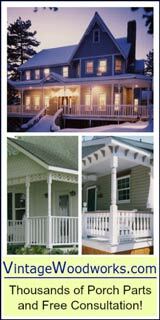 It provides the maintenance-free qualities of vinyl with the proven method of spline screening that adapts to wooden frame porches. Screen Tight is designed for both the do-it-yourself-ers and professional installers. It can be used on both remodeling jobs and new construction. 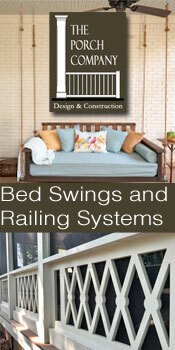 They also have a new product, the Minitrack system which is ideal as screen panels for porches. It's an ultra low profile system that is super for 2nd floor or porches that are higher. It blends in seamlessly and offers a variety of trim options. Fiberglass screen works best in the Screen Tight system. Aluminum screen wire will work too. Home centers usually carry this product. 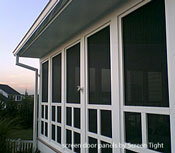 Disadvantages: Screen material - may have to purchase 18x14 fiberglass material (which is ideal for porches) separately. 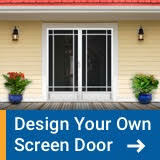 Use these screen door panels may be perfect as screen panels for porches. 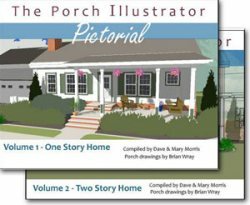 This option may work really well depending on how your deck or porch is framed (or how you could modify them to accommodate the screen doors). You can also use their acrylic panels to extend your outdoor time. You can purchase aluminum framing stock with spline grooves and construct frames. The screen is splined onto the frame and left exposed making it easy to maintain or replace. This is an easy DIY project. Advantages: Relatively low cost, good DIY project. 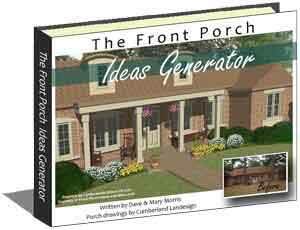 Screen porch contractors can build custom screen panels for porches. Or they may use another of the methods we've described above. 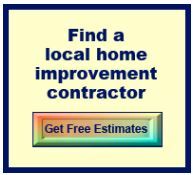 You can find a local contractor here. 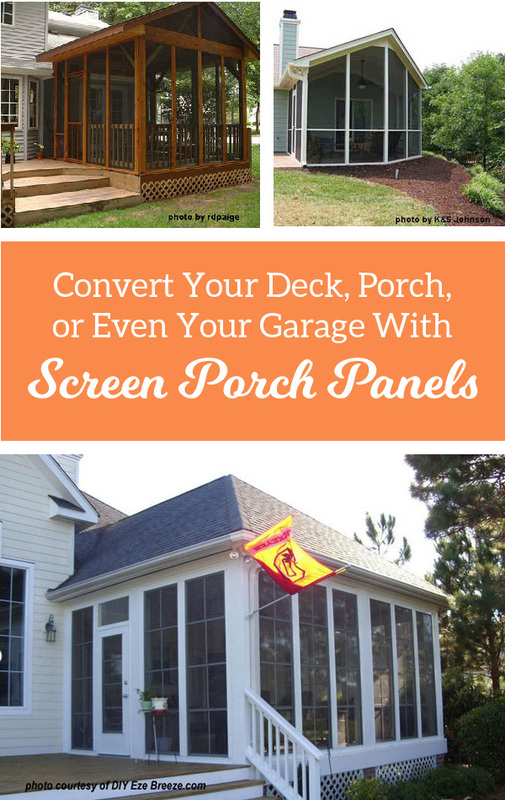 That's just a few ideas for screen panels for porches, decks, or patios.